Tropical rainforests fascinate scientists and explorers. The richness and variety of forms, and the diversity of species have been acknowledged for centuries. Measures to protect endangered species within this ecosystem were already thought necessary in the mid-nineteenth century. Since the 1920s commercial greed, political misdemeanour and the relentless increase in the human population have all posed increasing threats to the future of rainforests. Sustainability is now of paramount importance. This book applies the large body of knowledge, experience and tradition available to those who study tropical rainforests. It describes the principles of integrated conservation and management that lead to sustainability. It identifies the unifying phenomena that regulate the processes within the rainforest and that are fundamental to the ecosystem viability. Features of the natural forest and the socio-cultural ecosystems which can be mimicked in the design of self-sustaining forests are also discussed. 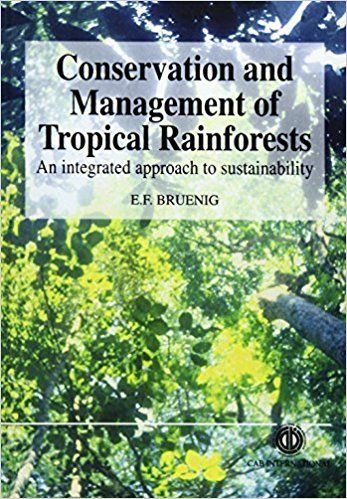 A holistic approach to the management and conservation of rainforests is developed throughout the book. Many practical examples and field studies from Amazonia and South East Asia, particularly Sarawak, are included. This book is a substantial contribution to the literature, it is a valuable resource for all those concerned with rainforests.